Who has a crush on on ami in the sailor moon super s ビーチ episode? According to your zodiac sign, which Sailor Senshi あなた would be? What goddess are each of the Senshi reincarnated または descended from? Could あなた 一覧 all of the ミュージカル in chronological order? a comment was made to the poll: Do あなた Preffer the マンガ Version of Sailor moon または the Anime? 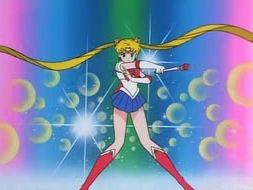 In which season was SM using MOON PRINCESS HALATION ?